Hey there! Thanks for dropping by Monique's Fitness and Health Blog! Take a look around and grab the RSS feed to stay updated. See you around! I really love this and it’s actually really good. This recipe actually makes 6 servings so you can always eat this throughout the week. Rinse chicken and pat dry. Set aside. Heat oil and garlic in a large non-stick skillet over medium-high heat. Add chicken and brown. Remove chicken and set aside. Add onion and green pepper to skillet until tender. Drain fat and return chicken to skillet. Add remaining ingredients. 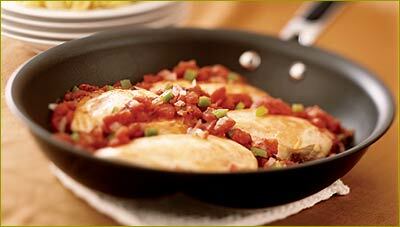 Cover and simmer over low heat for 30 minutes or until chicken is tender. Remove bay leaf before serving. I’m glad you liked it!!! MoFit "You Can Never Have Enough"